Blogging sensation and family man Jason Good delivers a laugh-out-loud reminder that everything is easier and more fun when approached with a sense of humor—especially parenting. Each list captures a perfect (or perfectly terrible) aspect of parenthood while wholeheartedly embracing every moment: "You Deserve a Break" offers ideas for downtime, such as giving blood and untangling cords, while "Self-Help from a Three-Year-Old" collects such wisdom as "If you fall down, stay down. Someone will pick you up eventually." 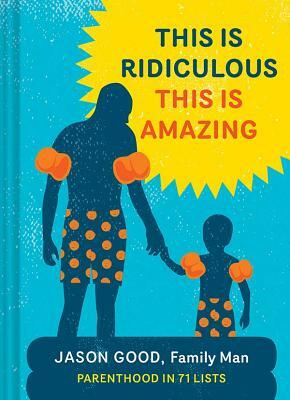 Sweet, sincere, and oh-so-true, this is the ideal gift for parents who could use a laugh. And isn't that every single one of them? Jason Good is a writer, comedian, family man, and the blogger behind JasonGood.net and the viral posts "3 Minutes Inside the Head of my 2-Year-Old" and "46 Reasons My Three-Year-Old Might Be Freaking Out." He lives in Minneapolis, Minnesota. "Jason Good might be known casually as the Dad blogger who made it big, but that's simplifying things. His blog is great, but his first book is even better."